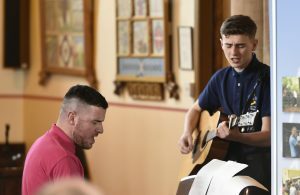 The achievements of 29 young volunteers from The Boys’ Brigade have been recognised at a national graduation ceremony at St Ninian’s Church, Stonehouse, South Lanarkshire, on Saturday (30 March). 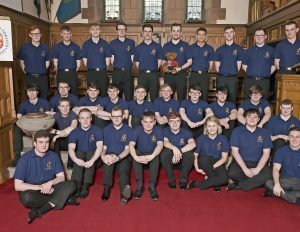 The young people from BB groups from across Scotland have graduated from The Boys’ Brigade’s 2017/18 KGVI youth leadership course. The course, which is levelled and credit rated by the SQA to the Scottish Credit & Qualifications Framework, is designed especially for young people aged 17 - 21 to support them move into leadership roles within The Boys' Brigade. The experience is like no other offered within the organisation and equips participants with the skills, knowledge and confidence to become an effective youth leader. KGVI graduate Heather Paul, 19, is a young leader with the 8th Paisley BB. Iain Lang, 18, 1st Alloway BB, also graduated from the training. The course, lasting 53 weeks, consists of two one-week residentials take place at Carronvale House, The Boys' Brigade's national training, recreation and residential facility in Larbert, Stirlingshire – and a year of supervised support leading activities in local BB groups. Since the 1990s, it has been endorsed by the CLD Standards Council for Scotland. Alan Anderson, KGVI course leader and BB volunteer leader, highlighted the impact these young people will have on the organisation and the wider community. “Our course was designed to enable everyone to further develop existing talents and skills as well as learning new ones. KGVI training was started in 1954 in memory of King George VI and since its inception over 2,400 young people have participated in the course. “Many congratulations to the KGVI Graduates who have worked so hard to complete the training. They and their families should be incredible proud of this achievement. “The BB offers a wide range of training and skills development opportunities, but the KGVI experience is unique – offering young people a chance to develop leadership skills, create lasting memories and also achieve a recognised qualification. To find out more about the KGVI Youth Leadership course, please go to the KGVI page.